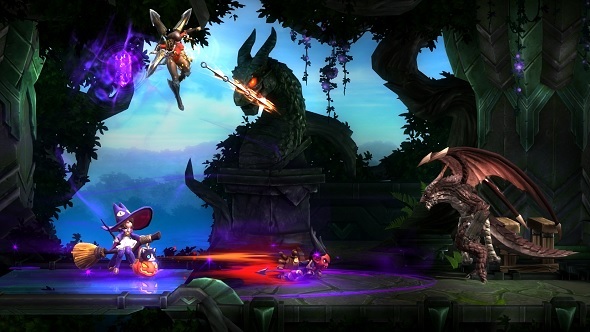 Free games: Win four characters for energetic, brawler-based MOBA, Hyper Universe! If you haven’t got into Hyper Universe yet then we are here to help you out. This is an energetic brawler featuring characters from across the many universes of action-based fiction. Some of them you need to buy, but to save you some money, we are giving away MVP Starter Packs, which each contain four new heroes for you. Before we get on to how you can win one of the Packs, let’s first go over what Hyper Universe is all about – it’s best you know what you’re getting yourself into. The idea is simple: two teams enter the game’s sidescrolling arenas but one leaves as the winner. It combines a side-scrolling brawler with the MOBA meaning that, as well as punch and kick, you can set down defense towers, monsters, and minions to help you. Where Hyper Universe will draw you in is its fast-paced combat and team composition. You can have a range of melee, support, and ranged combatants, each with their own fighting styles and looks. There are over 40 playable characters, ranging from kraken to power rangers, to snowmen and transforming robots. Ready to get into it? You can download Hyper Universe for free on Steam. The MVP Starter Pack will cost you – unless, of course, you win one from us. You can put your name into the hat via the widget below. Every action you complete is worth one entry into the giveaway, and the more actions you complete the more chance you’ll have of winning. We’ll also need your email address so we can send you a code upon winning – we won’t send you spam, we promise.